Nepal Helicopter tour package offers an exciting and memorable heli ride tour above snow-capped mountains, glaciers, farmlands, valley, cities and green jungles. Nepal Helicopter tours are famous for the mountain views and charter ride to explore the beautiful hills and reach to the remote destination in short period of time. Nepal helicopter ride tour packages such as Everest Base Camp Heli tour with landing, Annapurna Base Camp, Kathmandu Lukla Helicopter Flight and Langtang are the totally mountain sightseeing tours while Simikot to Hilsa, Muktinath heli ride, Damodar Kunda heli ride and other temples and monasteries visits are religious tour. Those who are bounded by limited time but want to see the close up vistas of high Himalayas, these helicopter tour packages are best option. Private helicopter charter flights and group joining helicopter tours are the options to enjoy the Nepal helicopter tour in Nepal. 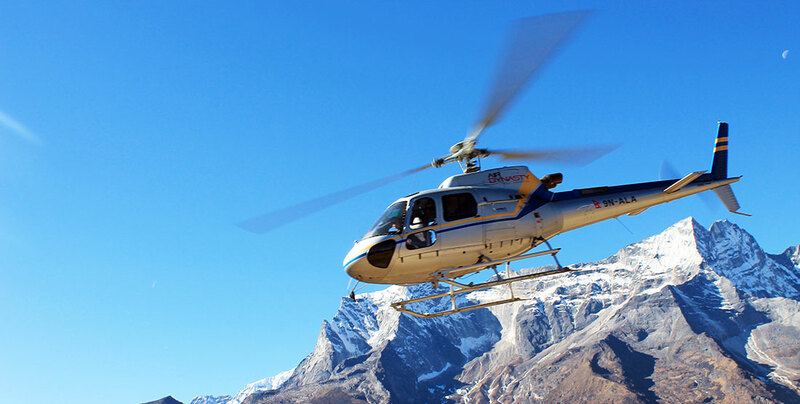 Nepal helicopter tour package are more frequent in the months of March, April, May, October, and November of the year. Private charter flight can be possible in clear days of any time in during the year. The helicopter tour packages are design on the basis of group size, tour itinerary, cost and weather conditions. All Nepal helicopter tour packages are weather dependent. Similarly for the mountain sightseeing, a clear visibility is the most condition. Whatever the condition and other things, Nepal helicopter tour is not comparable any other aerial tours in the world. Nepal helicopter tour package is an opportunity to explore around the geographical territories of Nepal ranging from plain Terai region to the world’s highest Mount Everest range. The helicopter tour cost is expensive in compare to other kinds of tour package but the views you can enjoy is beyond the imagination. Some of the most popular helicopter tour in Nepal are described below. Read out about these tours and enjoy your helicopter charter flight tour in Nepal to explore the beautiful and mighty Himalayas. Everest Helicopter Tour starts from Kathmandu and follow the Himalayan range of eastern Nepal. It lands at Lukla for fueling and flies to Kalapather or Everest Base Camp. This tour is popular for landing at Kalapathar from where you can see the Mount Everest just in front of you in eye level. The several high Himalayas and glaciers are the major highlights of this Everest Heli tour. This tour is famous as Everest Base Camp Heli Tour with landing for photography. You can get several group joining Everest Helicopter tour if you are single and want to share the charter flight cost. 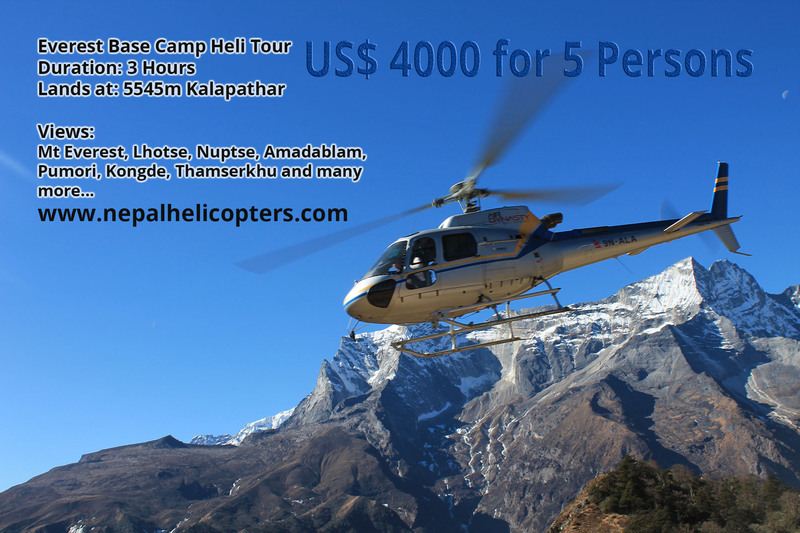 Annapurna Helicopter tour package starts from Kathmandu and Pokhara. From Kathmandu it takes around 3 hours and from Pokhara takes only one and half hour. Annapurna Base Camp is the final destination to land during this Annapurna Base Camp Heli tour. This tour is best for to explore the high mountains, deepest gorge, conservation area and scattered traditional ethnic settlements. The highest peaks above 8000m seen during the ABC heli tour is Dhaulagiri, Manaslu and Annapurna I. The tour is now frequent from Pokhara. Visiting the scared temple Muktinath, this helicopter is best way for group travelers. Family pilgrimage tour is the most popular type of helicopter charter flight to Muktinath. The temple of Muktinath is the main attraction and the destination of this trip package. It has a Miracle burning lamp on the stream which is believed to be created by the Lord Brahma (god of creation in Hindu mythology). Gosainkunda Helicopter Tour package is famous among the Hindu devotes to visit the scared lake Gosainkunda which is located to the north of Kathmandu which is close to the Tibetan border. The shortest mountain helicopter tour to Langtang valley is Langtang helicopter tour. This tour is best for those who want to see the beautiful mountains closer in very short period of time. Lukla flight from Kathmandu is the most popular and best option to enter the Everest region for any kinds of tourism activities. Trekking, peak climbing, mountaineering, skydiving or any other kinds of activities starts after the Kathmandu to Lukla mountain flight. Lukla is a small airstrip and it is considered as dangerous airport in the world. The Kathmandu to Lukla helicopter flight is approx 50 minutes to one hour in duration. Each helicopter flight normally carries 5 persons at once excluding pilot.